I wrote the last entry 4½ years ago, thinking my job couldn’t get any better. I was as happy a cog in the machine as any, and that was all there was. What happened? Change happened, as it always does. People leaving, priorities shifting. So I finally — finally — decided to continue on my own and start my own business. When I was in college, a long time ago, I tutored a fellow student for the one mathematically-themed compulsory subject in our major. Our relation was complicated somewhat because she hit on me, which, normally, I wouldn’t mind; but she smoked, was twice my age and a complete nervous wrack. Not sure what put me off most. Anyway, perhaps because of her age she took it upon herself to tutor me back with what she thought were the important lessons in life. As long as these lessons remained non-physical, I didn’t object. Maybe I should have, as I was easily impressionable. Even at that age. Before going back to college, my ‘tutor’ had worked as a journalist at a local newspaper. These years had provided her with much of the wisdom she now ventured to part on me. (Hopelessly failed relations with numerous men were another endless source of wisdom). One day we were strolling across the campus grounds, talking about life after college. At that point I was still determined to stretch my time in college as long as possible. College life was a near perfect starting point for the writing career I envisioned for myself. I was winging most of the tests they threw at us (there weren’t many) with a minimal amount of actual studying. It was the time of my life. I didn’t do much writing, but I figured that would come when the time was right. At the time it was exactly what I wanted to hear, so I probably didn’t object much more. Work is like prostitution. Somehow it became a fundamental adage to me, fixed tightly among the most basic values and beliefs I’ve held over the years. Even when I started to work, much sooner than I foresaw at that moment. Even when work actually turned out to be not that unpleasant at all. My first ‘real’ job was so much fun that studying soon began to suffer. A writing career seemed even further away now. Never mind, I was sure that would come when the time was right. Still, however much I enjoyed work, the idea that I was doing something wrong never really disappeared. I was selling my body, giving away control. I felt guilty for enjoying it. I decided to make the most of it at least, to keep working till my 40th birthday; then cash in and live quietly somewhere, finally become a writer. My 40th birthday came and went. By then I was already working for Trivento, where work felt more like a group of friends making money with what we loved doing: making people happy by building software. I remembered the deal I made with myself, twenty years earlier. “Ten more years,” I thought. I liked working but still I kept feeling I should really be doing something else. Something more meaningful. Something for myself instead of someone else. I can’t say I make a living by catching fish or building shelters; nor am I saying that Trivento is much like Automattic. But working with a group of people you know well and trust implicitely, building something together that will ultimately give people the pleasure of doing their job more efficiently: that’s what gives me satisfaction. Why would I ever want to do something else? Last March 10-12, I visited the QCon London 2009 conference. Besides feeling very much at home in London (been away too long), I had an excellent time listening to many great speakers and thought-provoking talks. This is an account of my visit and the best sessions I attended. In this, each trait defines specific attributes for each facet. If you do this well, the traits can be made generic and therefore reusable. It does require a rather different view on how to model your classes. And talking about modeling: how would you model this? You could probably model traits as interfaces or abstract classes in UML. Overall, Scala played a somewhat strange role during the conference. It was mostly in the air. Nobody was explicitly fanatical about Scala; even the speakers doing the Scala talks were most enthusiastically watching Hickey’s Clojure sessions. And of course, in Hickey’s view, Scala must be evil, as it’s still object oriented (besides the functional elements it does contain). On the other hand, more and more people I talk to are convinced that Scala would be the best sequel to Java; and less and less people think the more complex and extensive possibilities of the language will be too high a barrier. But the multitude of ‘new’ languages already started on Tuesday night, at a prequel to the conference at ThoughtWorks’ London offices. There, Ola Bini spoke for two hours about developing a new language for the JVM. Although his examples were in JRuby and Ioke (the language he developed), I had expected even more about Ioke itself. Instead, we got a rather generic presentation about developing a language. Nevertheless, those two hours went by in a flash. Besides, I enjoyed the opportunity to look around at ThoughtWorks. The people at ThoughtWorks had somewhat underestimated the number of visitors so there was barely enough room for us all. Still nice to be there. I skipped Fowler’s talk about three years of Ruby experience at ThoughtWorks. It’s sad, I was really enthusiast when I wrote my first lines of Ruby, and I still think it’s a beautiful language, but I don’t think that Ruby is the best language/tool for the code I most want to write (back end domain logic). So the only time I saw Fowler in action (outside the White Hart pub) was in the presentation of the software used for Obama’s presidential campaign, which he delivered together with Zack Exley. In an inspiring presentation (also considering the time of day, Wednesday afternoon, just before the party) they talked about how ThoughtWorks had integrated existing and new software into a solid running system with which campaign workers and volunteers had been managed. Fowler would not say if this had won the elections for Obama, but it was clear that Obama has made use of the Internet like no candidate before him. Eric Evans, author of Domain-Driven Design, looked back on the five years that had passed since the book came out. One thing he would have wanted to emphasize more was mapping of contexts and context boundaries. Evans considers a domain model to have boundaries based on its context: an entity (like Person) might have a whole other meaning from one domain to the next. Also, he feels that the building blocks for designing a domain model (e.g. Entity, Value Object, Factory, Repository) are often overemphasized. It’s not about the building blocks, it’s about the principles of DDD. I couldn’t agree more. Nevertheless, Evans described a new building block that isn’t mentioned in the book: Domain Events. Domain Events should not be confused with technical events; they’re events in the domain that have meaning to domain experts. A DDD architecture can benefit from using Domain Events, because they offer a way to decouple subsystems. Also they may result in a better performing system, even though people often think otherwise. 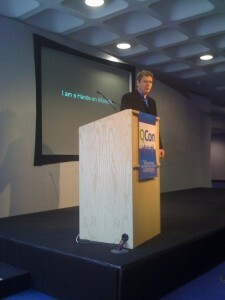 In a second session called Strategic Design, Evans discussed the situation where people who want to keep their application neat and clean, according to its architecture and design, often are being surpassed by the fast ‘hackers’ on the team, hacking something together without much regards for the rules — and who are also appreciated most by the business. Why? Because these hackers work in the Core Domain, adding core features that the business needs most. (I remember doing just that on several occasions, and indeed: users love you, fellow coders hate you). The designers/developers/architects that do care about the rules, are busy in the background fitting in and correcting these quick hacks. Something the business doesn’t really care about — if they even notice. So what can be done? Make sure you work in the Core Domain as well. Accept that not all of the system will be well designed. Isolate parts of the system that haven’t been well designed, map their boundaries, put an abstraction layer on top of them. And start building those core features, supported by a small piece of framework on top of these ‘big balls of mud’, the not so well designed systems that you won’t be able to change. The biggest challenge in a setup like that, I would say, is to prevent any new big balls of mud to take shape. Yet another speaker, Dan North, an architect working at ThoughtWorks, described how he eventually did manage to leave a big ball of mud a little bit better than he found it. 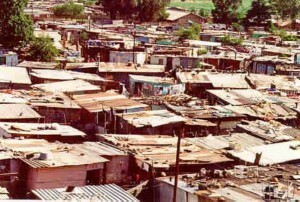 He used the metaphore of a Shanty Town. You can’t magically turn it into a neatly laid out suburb, but you can for instance attempt to install running water everywhere. But “you can’t buy architecture”. A running gag during the conference was that you could buy SOA in two colors: red (Oracle) and blue (IBM). Fortunately we know there’s more than that: SOA is a concept, not a box you buy off the shelf but something that you can achieve even with quite simple (and cheap) tools. 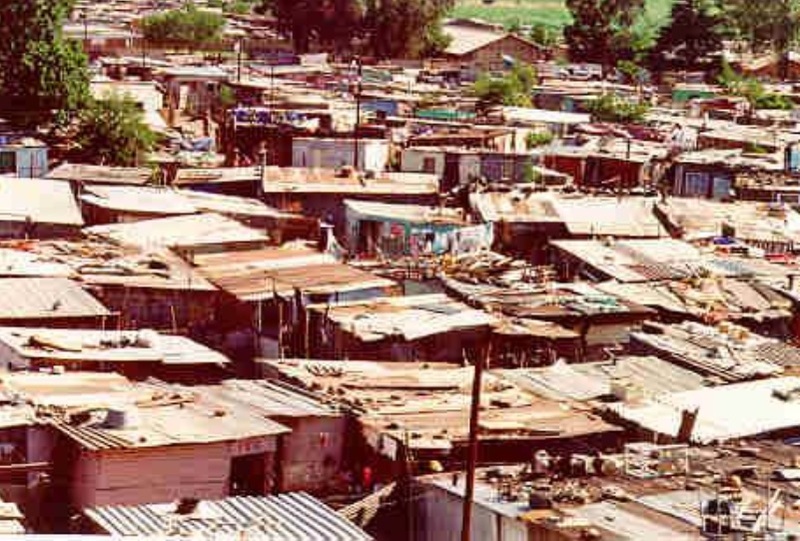 North’s idea of an architect is someone who collects stories, someone who’s able to hear out the history of the shanty town, who will understand decisions that have been made, even if he would have done it otherwise. When he’s heard enough, he won’t push through the necessary changes regardless and all at once. It is possible to take smaller steps, use transitional architecture, to get people used to the new ideas and to see how the changes turn out. Dan North comes across as an architect who’s just as concerned with the social aspects of software development as he is with the technical side of things. His last lesson learned: life moves on. Accept that people will make other choices after you’ve left the project. They may make other decisions than you would have done. If, some time after, you maybe get to talk to someone still on the project, you might hear that a theater has been built in the shanty town. Maybe not like you would have built it, but that’s the way it goes. The war on latency will become more important than execution profiling. If you have to tune a 9 to 5 system, record user actions during the day. You can use them during evening hours to simulate a representative load on the system. In order to tune well you have to benchmark. 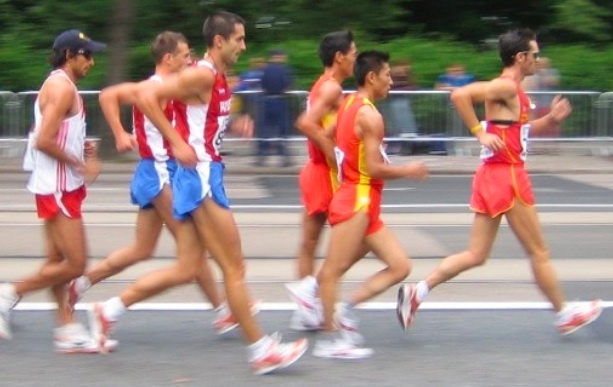 Benchmarking must be seen as a project in itself. And benchmarking might turn out to be more expensive than throwing more hardware to the system. If using ‘new’ languages (JRuby, Groovy etc.) causes performance problems, then these problems will be solved. Just like it happened with Java. The problem with marshaling XML in a SOA isn’t the time it takes to (de)serialize XML. It’s the time it takes to (de)serialize XML multiple times in the same request. I didn’t see much of the sessions about large web architectures: BBC, Guardian, Twitter. Although no doubt very interesting, this isn’t the kind of architecture I deal with on a daily basis. That in itself might not be a reason not to learn about them, it’s more that there were always talks, scheduled at the same time, that were more in my alley. 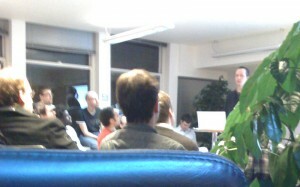 I did see a talk about cloud databases. Cloud computing, delegating parts of your system to services available on the web (just improvising a definition here), is hot. A cloud database is a database system that is available to you on the web. Instead of using Oracle you put your data in a cloud database. That might seem unthinkable to some, especially if, for instance, you have to meet strict security requirements. On the other hand, many applications don’t have to deal with such requirements, or find another way to deal with them. For those applications, cloud databases offer some attractive advantages. You don’t have to do maintenance or support for them. They can be almost limitless in size. Google’s BigTable (which is not available yet outside Google) is said to contain table 800TB in size, distributed over many servers. But the most interesting aspect of cloud databases is that they’re not (always) relational databases. Instead they often have some kind of cell structure, comparable to that of a spreadsheet. Each attribute value ends up in its own cell. You don’t have to define beforehand which attributes each entity contains. Not every row will necessarily use the same attributes. And the best part is that sometimes time is a separate dimension. If a row’s attribute already has a value, then assigning a new value will not overwrite the old one. The new value is added instead, with a version number or time stamp. Locking becomes a thing of the past. You will always see the latest (at time of retrieval) consistent version of an instance, but you could also request its state at some point of time in the past. The talk about cloud databases presented several implementations currently available, discussing their advantages and disadvantages. To me it became clear that this is just the beginning of the whole concept. There are many different implementations, but most are just ready or not ready yet. There are obvious disadvantages, especially the fact that you often have to use a custom query language instead of SQL. And the cloud database that seems to be the best — Google’s — is not (yet?) available outside Google. 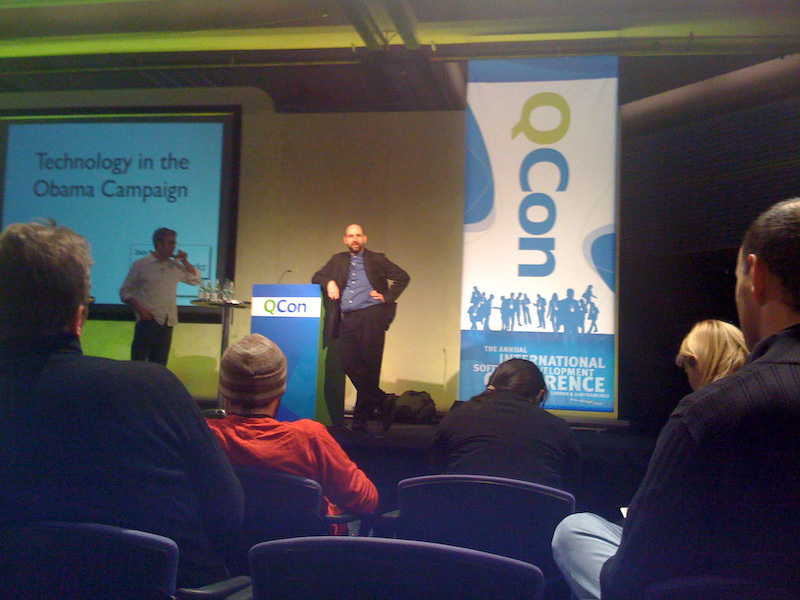 Looking back, I’m very much impressed by these three days of QCon London 2009. Biggest plus of the conference was its small scale. With just about 400 visitors, you’re likely to run into speakers during breaks, so it’s easy enough to talk to some of them informally. Likewise, sessions are smaller scaled, the conference rooms are smaller, you’re quite close to the speakers. But more importantly: these speakers all proved to be excellent. Subjects that were covered weren’t limited to Java, or to some vendor, but seemed to come directly from day-to-day experiences of professional architects and developers. That made them recognizable and means you can learn from them. And I’ve even had to miss many more interesting — parallel — sessions. My conclusion on the whole: I’m looking forward to next year’s QCon! The integration with Illustrator certainly did look handy. Named layers in Illustrator art work become objects you can refer to in the generated JavaFX code. I remember Adobe announcing Photoshop/Flex integration almost a year ago–is it there yet? This could seriously save lots of the tedious work converting graphic designs into application resources right now. One thing that became clear to me: JavaFX 1.0 as it was presented today is not ready to build serious enterprisey applications. Yes you can have flying, rotating and fading rectangles. You can display photos from Flickr in those rectangles. You can even embed a media player to display a movie trailer. But almost all components still have to be developed for JavaFX (or rather, reused from Swing). We’re a long way before JavaFX will be a serious competitor to Flex. One of the great features in frameworks like Ruby on Rails is that they enable you to focus on implementing business logic. No need to set up anything (other than a database connection). No need to be concerned with technical stuff: if you need to persist or query things, or mail something for example, the framework can shield you from the lower level and provides you with an easy to use DSL. A domain should be ever-expanding, it knows no boundaries. Changes in requirements should lead to additions, not changes to the domain. A domain should always be live, always active. A domain should be able to execute business processes dynamically. As business processes change continually, a dynamic domain model is a better way to support them than a process model, which is static. A domain should have no infrastructural dependencies (e.g. persistence, authentication, logging). Instead, it is surrounded by adapters listening to events happening in the domain. Adapters handle these events by calling on external services. As these services are independent of the domain, they can be made generic and therefore reusable between domains. A domain should be modelled using the time-inversion pattern and the active-passive pattern. That is: start modelling behaviour at the end of the process (in the spirit of demand chain management), and model passive objects in the real world as active ones in the domain model. And there’s much more to it, but you’d better visit Vens’ own site (although it is a bit fragmentary, unfortunately). Like I said, these are ideas that you won’t immediately find in Evans’ Domain-driven Design: Tackling Complexity in the Heart of Software . Evans emphasizes the importance of a shared, ubiquitous language and a shared domain model. Most of the book covers his ideas on modelling the domain. He says relatively little about the actual architecture of a Domain-Driven application. What he does say forms the linking pin with Vens: there should be one application layer for the domain, that doesn’t contain anything having to do with infrastructure. However great their ideas are, neither Vens nor Evans offer a practical implementation. What I’d really like is a framework ready to use, ready to start building a DDD application with. A framework that allows me to start implementing the domain model without worrying about technical stuff–because the technical stuff is all outside the domain in generic, reusable services. But also a framework that can be used pragmatically, together with other standard frameworks for building Java applications (e.g. Hibernate/JPA, JSF, EJB3 or Spring). Bastion wants to be that framework.